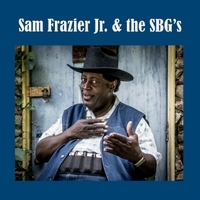 Original blues with a contemporary country acoustic style with strong vocals and great harmonica played by legendary entertainer Sam Frazier Jr..
Sam Frazier, Jr. is a rare bluesman. He plays the harp like Sony Boy Williamson, sings the blues like Slim Harpo, and sings country like Charley Pride, or sings his own original soul music. His band is just as versatile. You are never sure what Sam and the band might play, but you can be sure it will be good. And YOU WILL be entertained! Singer and harmonica player Sam Frazier Jr. recalled the time in the 1960s when he went to audition for a talent show held at Sonny Duke’s country music club in Birmingham, Alabama. Frazier was one of the few African-Americans who were playing country music, and this particular night he was the only black person in Duke’s. “All eyes were on me,” Frazier said. On harmonica, he played “Orange Blossom Special,” solo and also played Jimmy Reed’s tune “Big Boss Man.” When he got home, the club owners called him and asked him to play again. They told him the audience wanted him to come back to perform. Frazier became a regular performer at the club, and toured some with the house band. The story illustrates how Frazier has comfortably moved between the worlds of country music and the blues during a music career of more than 50 years. Frazier, who has recordings in both country music and the blues, and who learned harmonica from Sonny Boy Williamson and Slim Harpo, recently became part of Music Maker Relief Foundation’s group of artists. Frazier was born in the mining town of Edgewater, Alabama, near Birmingham. His mother would hold backyard barbecues where the liquor would flow, and musicians often would come and play. Among them were Williamson and Harpo, who both gave Frazier harmonicas and encouraged him to play. Both musicians “told me if I wanted to play it, just to stay with it,” Frazier said in a phone interview from his home in Alabama. “I picked up a lot on my own looking at them,” he said. Frazier started a one-man band (also playing guitar and drums), and taught his sister to play bass. They began to get work around Birmingham, and their music came to the attention of local DJ Maurice King, who put them in touch with a talent agent in New York City. He and his sister auditioned, and “They told us they’d like to take us to New York. We didn’t have but one day to prepare” to leave, he said. They talked to their father, pastor and others about the offer, and decided it was a good opportunity. In New York, they recorded several tunes, including “I Got to Tell Somebody” and “I Don’t Want Another Love” (in the rhythm and blues style) for the Goodie Train label. He recorded and played in venues in New York and New Jersey for about two years during the late 1960s and early 1970s, he said. When he returned to Birmingham and Sonny Duke’s venue, he came to the attention of Gordon Edward Burns, also called Country Boy Eddie, who had a country music show on Birmingham television. Frazier also played harmonica and sang lead vocals for a time in California with Johnny Otis’ Rhythm and Blues Revue. Sam’s blues and soul CD “Take Me Back” was released March 2016 by MusicMaker Relief Foundation. Sam latest record “Take Me Back” was released by Big Legal Mess in late July on both CD & vinyl. The original material was recorded in the early 70’s at Neil Hemphill’s Sound of Birmingham studio in Midfield, Alabama. It’s a piece of history!! Sam’s latest venture is collusion with Sam Gunderson and Sara Green. An acoustic duo, the SBG’s comprise of the well-known area musicians Sam Gunderson who played guitar for Taylor Hicks and Sara Green of the Sunday Lovers. With Sam Frazier Jr. fronting with vocals and harmonica, Sam and Sarah add acoustic guitar and vocal harmonies. The sound is a modern take on old time country Blues.